In an earlier post I mentioned Ghujdawani (d.1179), the first of the Seven Khwajagan of the Bukhara Oasis. Al-Ghujdawani’s teacher was Abu Ya`qub Yusuf ibn Ayyab ibn Yusuf ibn al-Husayn al-Hamadani (to give his full name). 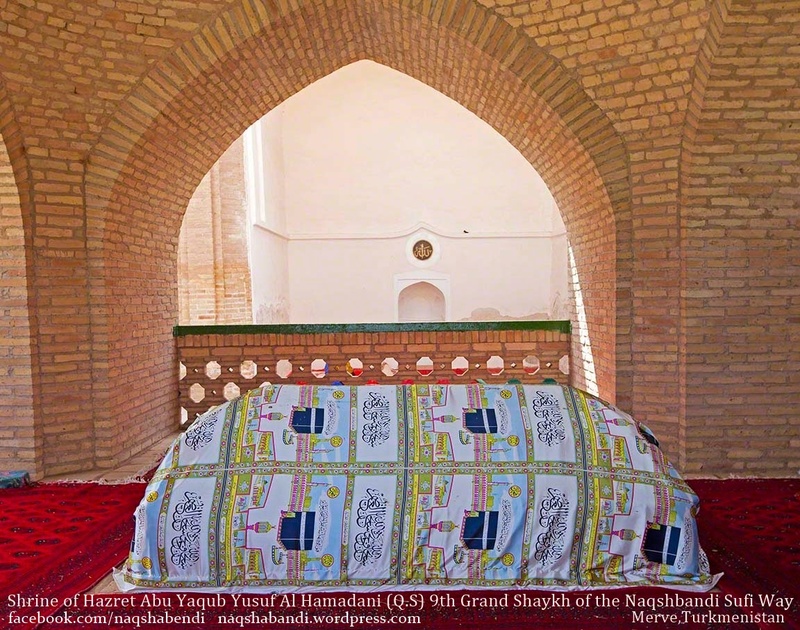 Yusuf al-Hamadani was born in 1062 in a village near the city of Hamadan in what was then Khorasan, now Iran. At the age of eighteen he moved to Baghdad where he quickly attained the reputation as one of the leading scholars of his time. Later in his life he secluded himself and left the world behind. He became an ascetic and engaged in constant worship and mujahada (spiritual struggle). He associated with Shaykh Abdullah Ghuwayni and Shaykh Hasan Simnani, but his secret was given him by Shaykh Abu `Ali al-Farmadhi. He made progress in self-denial and contemplation until he became the Ghawth (Arch-Intercessor) of his time. He was known as the Rain of Realities and Truth and Spiritual Knowledge. He finally settled in Merv. Through him countless miraculous events occurred. But ordinary scholars and many of today’s Sufi groups take “Arif Billah” (those who known God by the Knowledge of Wahdaniyya) to be highest level!. But the highest and most exalted Saints are those who are known God through His Exalted Witnessing (shuhada at-tanzih). One day he was holding an association in which he was enlightening the listeners with heavenly knowledge. Two literalist scholars who were present said, “Keep quiet, because you are devising innovation.” He said to them, “Do not talk about matters that you do not understand. It is better for you to die than to remain.” As he spoke these words they immediately fell dead. “The fate of Ibn as-Saqa was something else. He was brilliant in his knowledge of the Law of Islam. He preceded all the scholars in his time. He used to debate with the scholars of his time and overcome them, until the khalif called him to be a member of his court. One day the khalif sent him as a messenger to the King of Byzantium, who in his turn called all the priests and scholars of Christianity to debate him. Ibn as-Saqa was able to defeat all of them in debate. They were helpless to give answers in his presence. He gave them answers that made them look like mere students in his presence. “His brilliance fascinated the King of Byzantium so that he invited him to his private family gathering. There Ibn as-Saqa’s eyes fell on the daughter of the King. He immediately fell in love with her, and asked her father, the King, for her hand in marriage. She refused except on condition that he accept her religion. He did, leaving Islam and accepting the Christian religion of the princess. After his marriage he became seriously ill. They threw him out of the palace. He became a town beggar, asking everyone for food, yet no one would provide for him. Darkness had come over his face. “One day he saw someone that had known him before. That person relates: ‘I asked him, ‘What happened to you?’ He replied, ‘There was a temptation that I fell into.’ The man asked him, ‘Do you remember anything from the Holy Qur’an?’ He replied, ‘I only remember rubbama yawaddu-l-ladheena kafaru law kanu muslimeen (‘Again and again will those who disbelieve wish that they were Muslims’ [15:2]). Khwajah Yusuf Hamadani (R.A) died and was entombed at Merv. His mausoleum is today one of the most sacred and perhaps the most popular pilgrimage site in Turkmenistan.